"Perusing this book is nothing but pure entertainment, yet both fans and scholars of the sub-genre will come away enlightened...Kudos to Middleton for this huge bite into previously uncharted bloodsucker territory." "I wholeheartedly recommend this book if you enjoy reading about vampires on television, or if you are an author writing about those subjects. Un-Dead TV is an invaluable resource, and one that will find prized real estate on my office shelf." "Un-Dead TV fills a previously empty research niche, and provides lots of browsing entertainment. Vampire lovers and scholars should find much to like in these pages." "An exhaustive guide to over 60 years of the vampire on the small screen...[a] bloody big (514 oversized pages!) book of bloodsuckers." "Without television, our awareness of the vampire would be vastly different. The need for some guide through this world carved out by the televised bloodsuckers seems evident. Now we have Un-Dead TV as a map that will guide us through it. It will become the foundation volume of future study in the field." "Un-Dead TV is an amazing work, a vampirologist's dream resource book. From page one to the very end, even the most educated vampire researcher and knowledgeable fan alike will learn details on vampires in television's history. 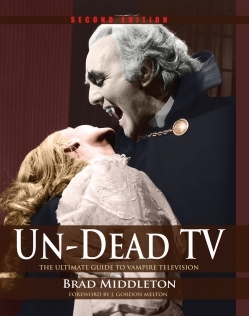 Author Brad Middleton truly lives up to the book's subtitle 'The Ultimate Guide to Vampire Television' as he covers everything from Dark Shadows to cartoons and obscure vampires you may never have heard of. Without a doubt it belongs in the library of anyone who is fascinated by vampires!"